Ever wonder how to make those Turk's Head Knotted Coasters? I'll show you how to do it with this DIY coaster tutorial. And I've seen the joke floating around the internet that goes something like this “Why buy it for $5 when you can make it with $90 of craft supplies.” Guilty as charged…sometimes. But, for those of us who need to have something to keep their hands busy while traveling or watching ‘Game of Thrones' (counting down the days to the season premiere…in May 2017!?) or just because we like to make things, the ‘crafter' hat is one we gladly wear. That “Hey, I bet I can do that!” crafter who loves a challenge is the one who saw these Turk's Head Coasters & Trivets in a charming little shop in New York last month and came home determined to make DIY coasters and trivets. Now lest you think that these lovely knots take some sort of knotting expertise, I can attest that they don't. While I was a Girl Scout many, many moons ago (and actually won some award for selling great quantities of cookies because I hit up all the sailors on the ship my dad served on), my knotting know-how began and ended with the making of a sit-upon during a camping trip on a beach on the island of Saipan with the largest coconut crabs my 7th grade eyes had ever seen. This disclaimer also holds to all the bona fide knotters out there who may be aghast at my ‘knotting' technique. This is the Lynn ‘layman's' version of making Turk's Head Knot Coasters & Trivets and is in no way to be interpreted as the ‘official' sailor, Boy Scout, mountain climber or what-have-you version of the Turk's Head. I'm sure that the ‘real' knotters out there don't use a little cushion with push pins, I mean they're scaling a mountain or rigging a boat or surviving in the wilderness with only beef jerky and a piece of rope and surely wouldn't have, or need, such cushion, cardboard, and pushpins. OK…now that we have that out of the way, let the knotting shenanigans begin. I used 3/16″ triple-ply cotton rope. You'll want to find the stiffest you can. I had to look around and finally found my best option on an Etsy storefront that sells bird toy supplies! Here's the link to the rope I used. I bought 100′, which will make 12 (3.5″-4″) coasters or 2 (6″) trivets and 6-8 coasters. Foam or cushion or corkboard. I used the backside of a computer lap desk. If you don't have what you need around the house, if you visit Michaels as much as I do, you can find supplies for most every crafting need under the sun. Determine the size of trivet or coaster that you want. (I find that the coasters lie a little flatter when closer to 4″ than they do at 3.5″) Multiply the dimension in inches by 2.1 to determine how many feet of rope that you need. Make sure to tape where you will cut so that your rope doesn't unwind. Using a compass or other device, trace a circle the size of the trivet/coaster that you want on a piece of cardboard. I taped my cardboard onto the back cushion of a computer lap desk, but a piece of foam or cork bulletin board would work well too. Use pushpins to make points of a star, approximately equidistant apart. Print off or refer to the diagram showing how the rope is woven under or over to make the Turk's Head knot. You can print the PDF here. In addition to the diagram, here's a video showing how to make the knot. This video is longer than my usual ditty, but it shows the process from start to finish. Once your knot is finished, sew the raw ends as shown in the following video. While the coasters don't need it, I opt to shore up my trivets just a tad. I do this by running a stitch through each of the bights, where it wouldn't be seen from the top. Once again, knot purists might shudder at this practice, but I am not a knot purist and just want to make sure the trivet is as snug as possible. Once you have made 1-2 of these coasters or trivets and get the hang of it, you'll be able to whip them out rather quickly. I made the 6″ trivet in the video in less than 13 minutes, complete with all my editorial comments! You could easily whip up quite a stash of coasters & trivets in a weekend and have a store for giving as gifts when you need them in a pinch. 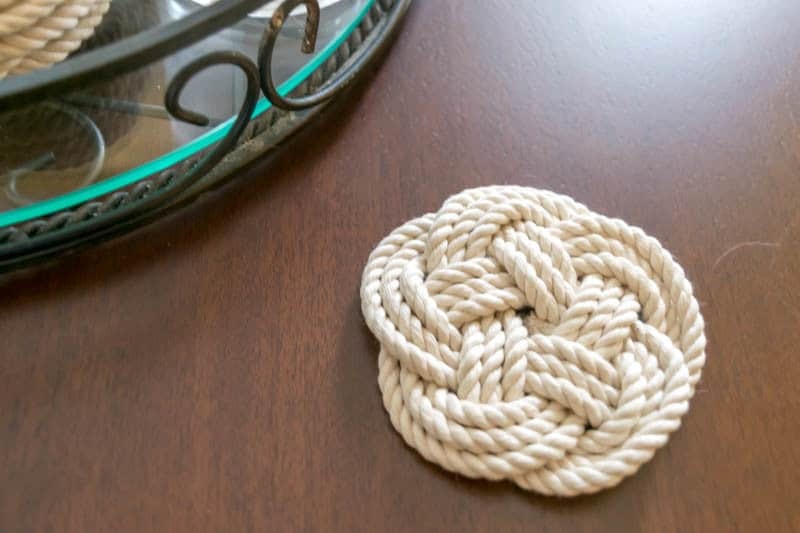 Turk's Head Knot Coasters & Trivets…Perfect for Gifting! 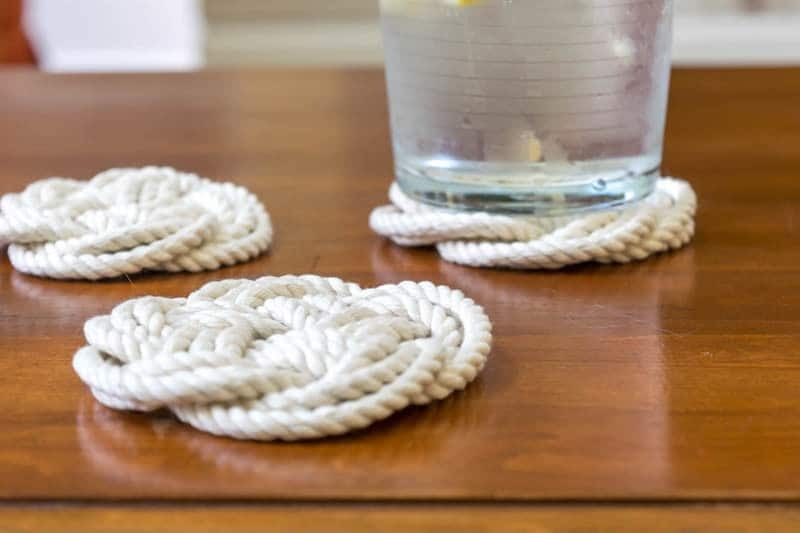 So there you have it, my friends… I'm crushing on the Turk's Head knot right now, especially in these DIY coasters & trivets. It was a good chance to don my ‘Hey, I bet I could do that!' hat and have something to show for it in the end. Cute coasters Lynn! They do look like they would be hard to make, but your tutorial makes it look easier then I thought they would be. Linda, my fellow ‘diy-er’, thanks for swinging by! Truthfully, with the print off, it’s really quite easy. Give them a try! How cute is this Lynn? And I’ve been wanting to make coasters but was never happy with what was out there. This would be perfect for me as it has the nautical theme going on! Right up your nautical alley Mary! They’d be perfect for you and for gifts! Have fun making them. Really quite easy when you get the hang of it. I’m applauding you for making these! They do look like it takes lots of concentration, but you did an amazing job and it looks like something you might find in a high end store. BTW, I took a look at those crabs, OMG…NO THANK YOU!! Hey Carol, it was an undertaking, but once I got the hang of it, it really was quite easy. I’m definitely gearing up to mass produce them for Christmas gifts! And those crabs…I know! Skeered the beejeebers out of me! Lynn, I love these so much! I need some new trivets to use on the dining room table and these are the coolest! I’ve Pinned and Stumbled so I can make sure to have the instructions on hand! Thanks for sharing how you did it, I’m definitely going to need that video!!! Hey Nikki…I know that when you give this a try,you’ll get the hang of it. Really quite easy with the print off of the diagram…I promise. Give it a try and let me know how you did! Hi Lynn, you are so clever! Just reading the instructions and looking at the images left me in awe of your dknotting skills! You say you aren’t a knotter, but I’m impressed. Thanks Debbie…promise you, my skills are really limited. Anyone could do this! Hope you give it a try. Lynn I am so glad I met you at Haven. Your blog is full of all kinds of great projects! I am going to try these. Hey Denise, so great to meet you too! Love all your jewelry designs…you have a good thing going on there! Are you back to reality yet? I’m still recovering, but also counting the days until next year! Interresting design, thanks for sharing! br br But I wonder, wouldn t the same be possibly using a print-out of such a coaster for the pin-placement? Just wondering whether the 3D-print is strictly necessary for those who do not have access to such a device. Hi Blake…the print out is not a 3D print out. In fact, it is just a print out of a coaster. If you have access to a plain old printer, you can print this out and use it for your design. Have fun with it! Oh…you’re a GOT gal too! I ❤ that show…especially Jon Snow, followed closely by Tyrion. Did you hear that there will only be 2 more seasons? I’ve been thinking of starting back at the beginning again, but can’t get my hubby on board with me on that. But yeah, I always need something to do when watching TV…once you’ve got the hang of it you could whip out a couple of these coasters during an episode…easy peasy. How long did it take you to make these? I am thinking of making these as part of my favors for my wedding but want to see how long it would take and if I would have the time to do it. Let me know they are super cute! Hi Jess…once you get the hang of it I imagine you could turn one coaster out in under 30 minutes…Think they’d be great wedding favors! Great idea. Get your fiance in on the action…you could whip out a bunch watching TV. Your tutorials are very helpful. Thank you very much. But ı have a problem. I want to make big pot holder from Turk’s head knot but I couldn’t find any instructions. Do you know the technics of it? Your answer will be highly appreciated. Thanks in advance..
Hello Nilufer…are you talking about a potholder that you would hold in your hand or one that you would put on table to put your pot on? My post does show how to make a trivet on which to put a a pot on while on a table, but not sure you would want to make a hand held potholder as I think the rope might separate and cause a burn. Let me know if the trivet is what you are looking to make and I will be glad to help.